Bought a Diablo Adios today. http://www.diablopaddlesports.com/ Crazy craft. A hybrid critter, half SOT kayak, half SUP. Stability, you ask? In spades my brother. A yard wide. You can stand right up, drift with the wind and fly cast all day long. Gotta love that. Finally I’m fishing the Florida flats for real. Sure flats boats are way cool. So why a “yak”. Well you’re talking with a guy that rowed a McKenzie boat for over a decade. At heart I’m a small craft dude, bigger boats have never called to me. I love the physical nature of rowing and paddling. Muscle, sinew, and bone against the elements. It feels so very right, so very real. 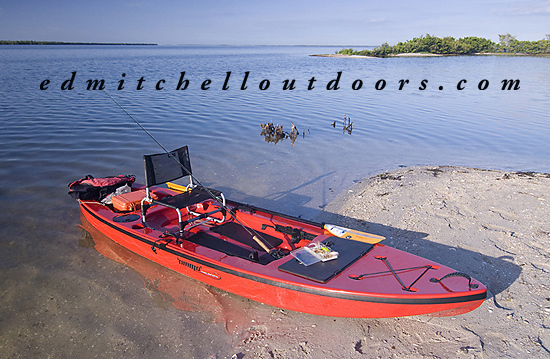 Its also clean, cost effective, sleathly, sight-fishing capable, and you can get out an wade! Ecologically friendly? Yup. Doing my part to keep things green too. Screw those deep-vee hull and their tripower outboards. May they find a home in Hades. This entry was posted in Diablo Adios & Chupacabra, Fly Fishing in Salt Water, Gear, Kayak / SUP Fishing. Bookmark the permalink. Looks like Fun Ed. Can’t wait to see what you catch from that. Are you car topping it or do you have a trailor? I assume that would work in Nini or Quanny. Yesterday I caught two nice snook on a 6-weight. Man that was fun! This Adios truly rocks, love it. Yeah it would be super in Ninny or Quonny. I’m car topping. Easy getting it down; you just cover the trunk with a blanket and slide it off the rack. Piece of cake. But its a grunt going back up. I’ll sent you an e-mail with more info. Hope all is well up north…. Great craft for your area because it eliminates the risk of stepping on a sting ray. One thing to consider is the weight of the paddle. The lighter the better. A friend carved a “Greenland” style paddle of a solid piece of wood. The blade ends of the paddle are not as wide as a typical kayak paddle. It seems very effective, strong and light weight and can be used to pole around. Whereas a lightweight kayak paddle has a fragile blade, too thin to use to pole around. Good to see you’re finding out the good places to fish, eat. etc. The feature I like best is the ability to stand up and sight-fish. Blind-casting is just nowhere near as much fun. You’re right paddle weight can be an issue, and with this craft paddle length is important too. Right now I have a 240cm loaner from the shop. Its a tad short for a boat of this width so I have a 250cm paddle on order. Not doing any poling, at least yet. Instead I try to glide into areas quietly and then stake out or drift. I may get an SUP type of paddle at some point, but they are very expensive. At the moment Tropical storm Debby has got the water all clouded up. Should get back out in a day or two.